Jim Carrey stars in the hilarious family film “Mr. Popper’s Penguins” based on the beloved children’s book of the same title. Thom Popper (Jim Carrey) is a workaholic New York businessman who has neglected his family in order to pursue his real estate career. 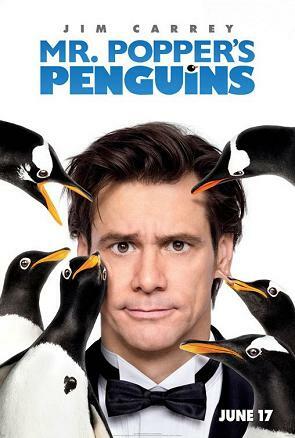 His life suddenly takes a dramatic turn around when six penguins are delivered to his apartment and he is forced to become their full-time caretaker. The penguins are undeniably cute but inevitably cause chaos, gradually showing him what is really important in life. The supporting cast includes the legendary Angela Lansbury, Carla Gugino and of course, six Gentoo penguins. Catch the trailer of "Mr. Poppper's Penguins" after the jump. “Mr. Popper’s Penguins” will open in local cinemas on June 17 from 20th Century Fox.